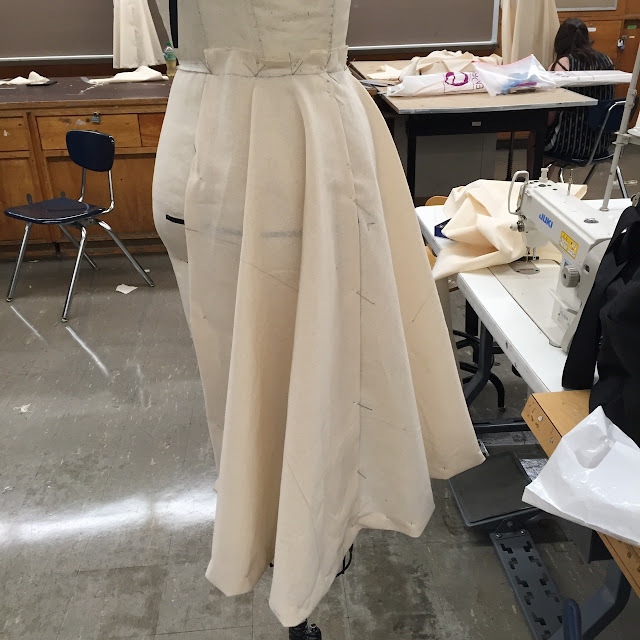 In my third week of Draping I at the Fashion Institute of Technology (FIT), we draped both skirts and bodices. 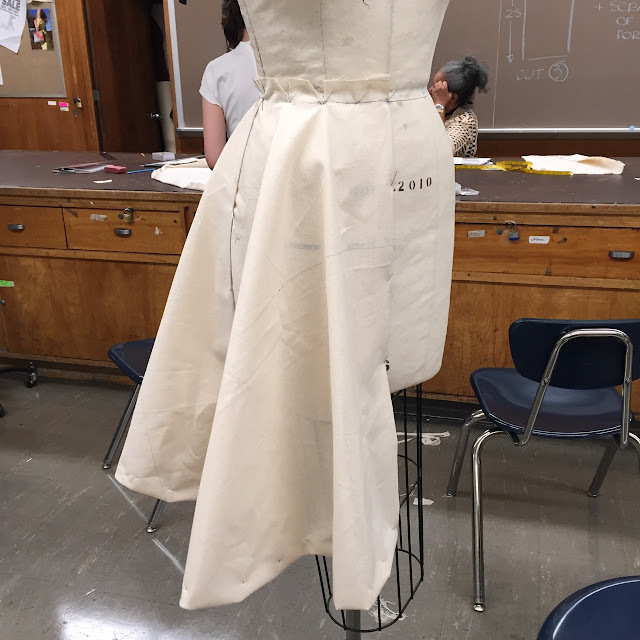 Having already made a straight skirt as well as a gathered skirt with hip yoke, this time we made a flared skirt (pictured up top and below). 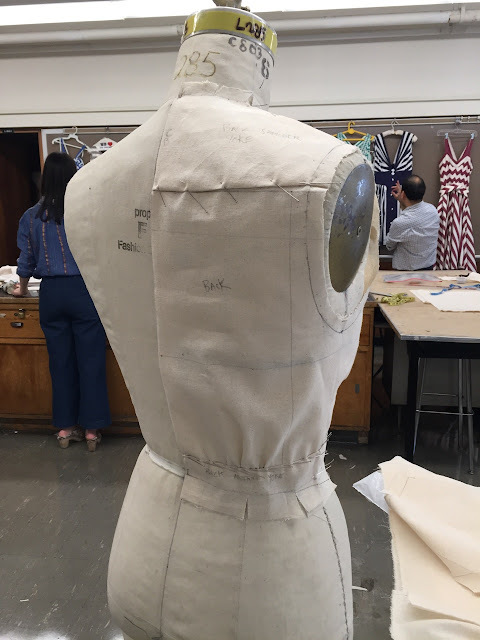 No matter what kind of skirt we're draping, we want to keep our center back and front lines vertical and our hip line horizontal. For the flared skirt, it was up to us how full a skirt we wanted to create. It will come as no surprise that I made mine about as full as my piece of muslin would allow! Next, we made two kinds of bodices: one with a back and front midriff and shoulder yoke, and one with princess seams. We've focused a lot on dart manipulation, which is something I also learned how to do in patternmaking class last fall. 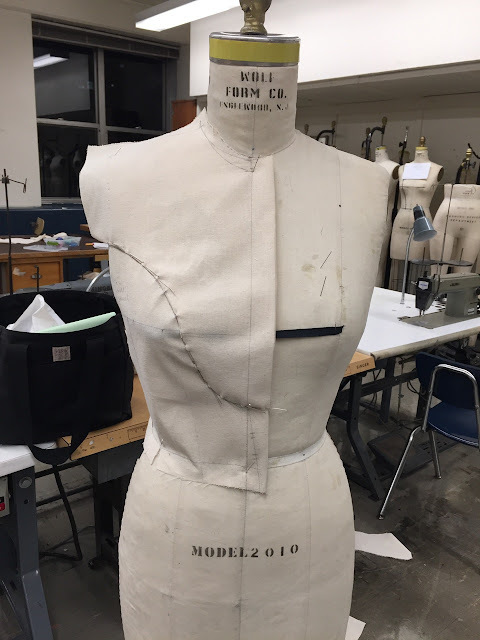 We're accustomed to darts coming from the side and waist seams, but they can also be drafted to come from the center, shoulder, neckline, or armhole seams. As long as the dart removes the same amount of fullness and has the apex of the bust as its center (though the finished sewn dart will usually end at least 1" away), it can go almost anywhere. Darts can also be substituted with gathers and tucks. 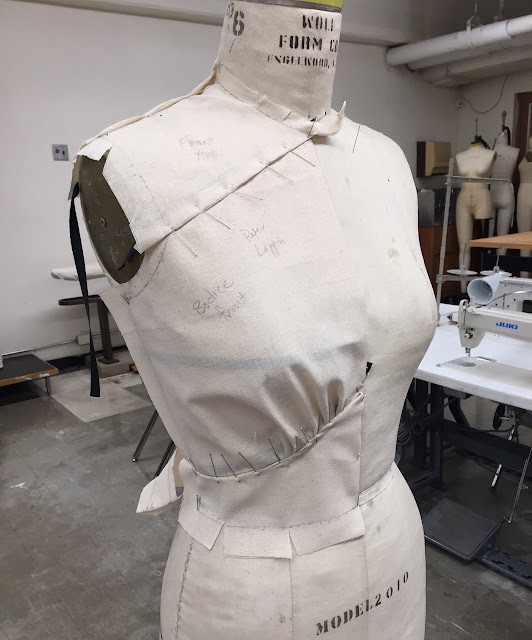 For the bodices, we designed our own yokes (and later, princess seams) using style tape. One of the things I love most about this class is that we're invited to use our imagination and be bold. It's fun to see what different people come up with! 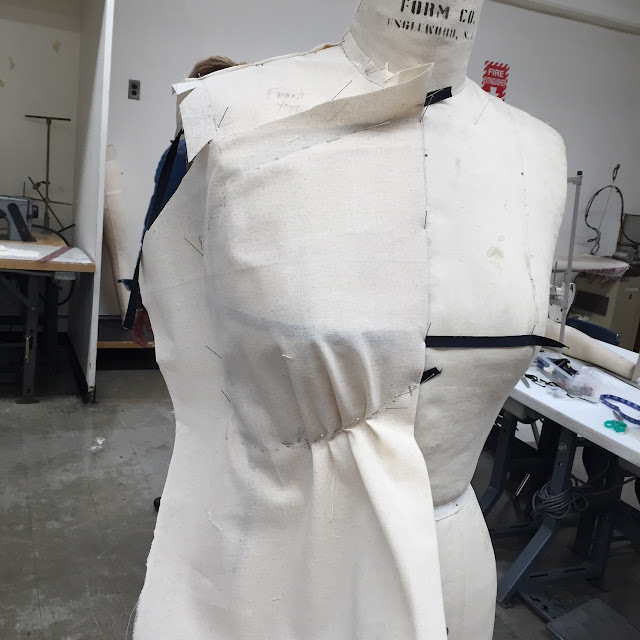 Here are some shots of how I draped my yoked bodice -- again, the style lines were up to us. As you can see, the princess bodice resembles a blouse with a plastron (the pleated part of a shirt front on a men's tuxedo shirt). The princess seam doesn't have to originate at the waist or the shoulder the way most princess seams do, as long as it travels near the apex of the bust. 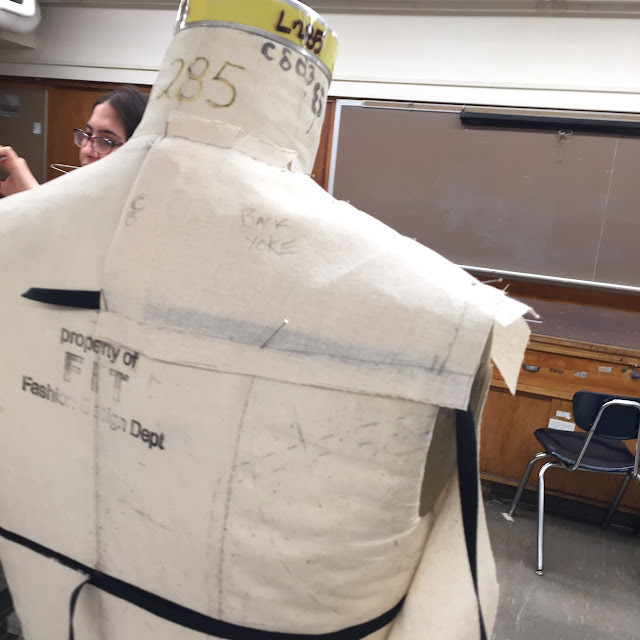 Meanwhile, we're starting to plan our final projects, to be made with striped fabric, which can include the designs we've already draped, or something else altogether. Since we're learning new techniques every class, new possibilities arise daily. 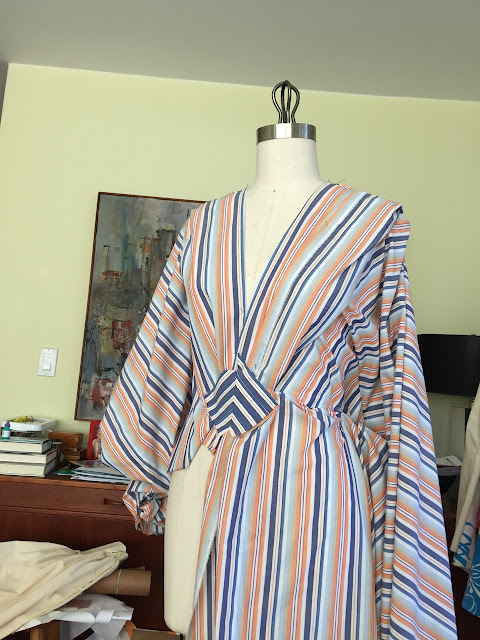 I've started doing some experimental draping at home with the striped fabric I chose, as well as collecting photos of striped dresses that inspire me. It's fun! And that's it. Much more to come in the weeks ahead. Oh, it so much fun to play with fabric! I'm glad you did this for yourself, and am glad you are having such success at it. Thanks! It's really a blast. 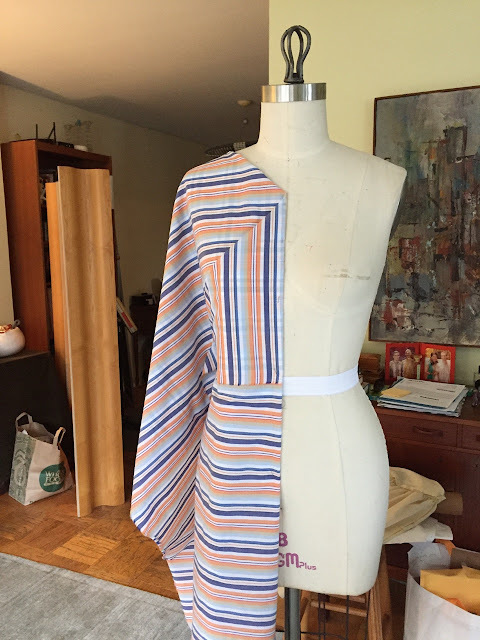 I know you're not finished yet but so far, what do you find easier, pattern cutting or draping? 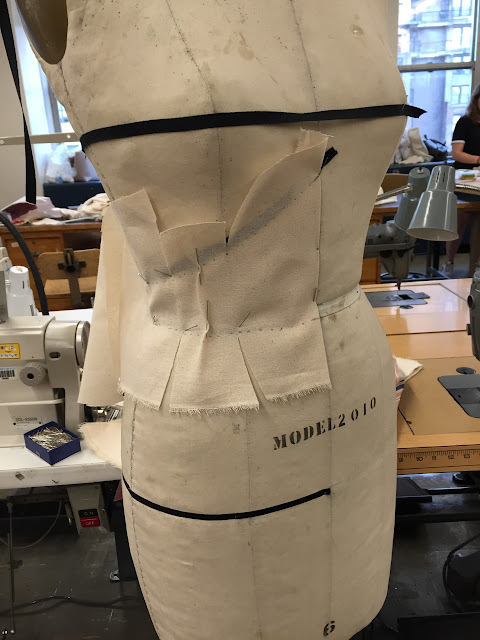 Draping still requires making a paper pattern, it's just that draping allows you to see your design before you make the actual pattern. When can I sign up for your class? Thanks for letting us take a peek at what you're learning. 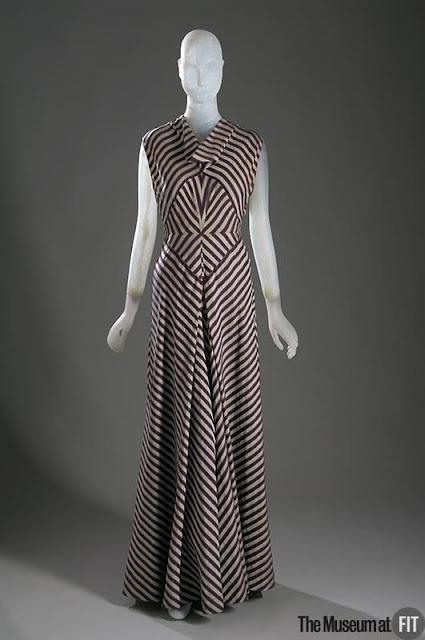 I look forward to purchasing a Peter Lappin original pattern. Wow. I am not worthy. Thanks for sharing! Those pins look as if they will fall out any second. Why are they set in that way? I can almost smell that classroom! I'm so glad you are going and sharing with us. Wow! Looks like a really fun class. Thank you so much for sharing what you are learning at FIT with us. I look forward to your next post. I am clueless about draping. How do you get it off the mannequin? Do you hand tack it together as well? You mark your muslin in pencil (darts, neckline, side seam, etc.) and unpin it from the dressform. Then you transfer the markings to pattern paper.